Chef Thomas Stuart rounds out a day of relaxation with soul-nourishing comfort food. 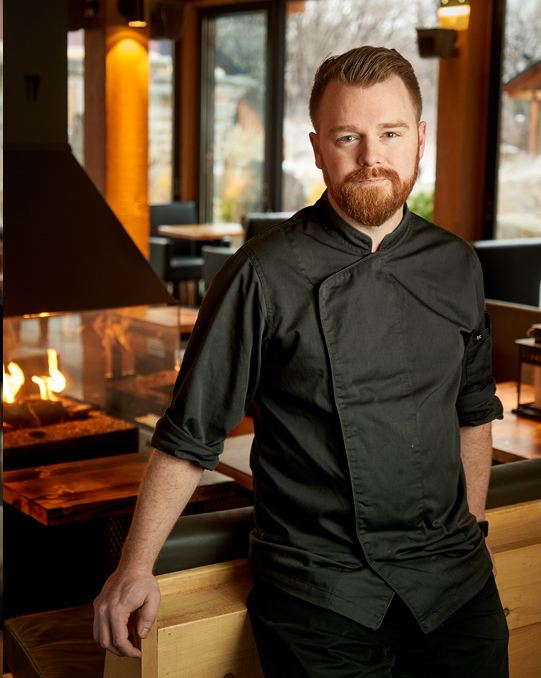 Chef Thomas Stuart strolls through the dining room of the restaurant at Thermea by Nordik Spa-Nature, leading the Ciao! team on a visit to sample his inventive dishes. They pass diners in plush white bathrobes enjoying food inspired by Scandinavian cuisine and Manitoba ingredients. Steam rises from the hot pool, surrounded by a park-like setting, visible just outside the bistro’s large, gleaming windows. Nowhere else in Winnipeg can you go from a sizzling sauna to a frigid pool to dining on an exquisite meal – wearing a robe. Thermea is all about relaxation and rejuvenation of the mind, body and soul, whether in its heated pools, steam rooms, dry saunas or quiet rooms. As chief of the food experience, Stuart pairs relaxing time with a menu that has the customer’s soothing needs in mind. And the setting suits him – he’s calm, cooly confident and speaks in a tranquil tone. The 35-year-old chef wants people to feel relaxed and have a great time. He does his part by creating memorable, healthy and comforting food. Spa food has a lot of baggage, Stuart says, adding that it brings to mind bland health trends of the 1980s, like crunching on iceberg lettuce and micro greens. Spa food can be so much more, he says: it can be comforting, like his take on a gooey croque monsieur, or hearty and nourishing, like his beet bowl, which features four different preparations of the root veggie. Stuart started at Thermea five years ago while the spa was still under construction. As part of the interview process, he had to prepare a multi-course dinner that represented his style of cooking. He made sous vide Manitoba bison tenderloin with coffee-infused gravy, caramelized carrot soup, and a lemon curd tart with pistachio foam. “It was a fun challenge for me – and it was nerve-racking,” he says. Stuart got the job, and with it, came the freedom to develop a menu for a restaurant unlike any other in Winnipeg. Stuart draws on those influences to provide a unique experience for Thermea’s visitors, who, when planning a day of soaking and steaming, may view food as a second thought. But the spa’s thermal cycle – going from a steamy sauna to a frigid pool – makes spa-goers naturally hungry, Stuart says. Other cultures and countries have always provided inspiration for the Winnipeg-born and raised chef. Fresh out of high school, Stuart didn’t know what he wanted to do; he tried university, he dropped out halfway into his first year. Instead, he decided to travel to Europe for three months. He absorbed the culinary cultures of France, Switzerland, Greece and Morocco. From wandering the fresh food markets to eating tripe for the first time, the adventure opened his eyes to the world of food. “Going from country to country and seeing the food scenes that I didn’t see in Winnipeg at the time inspired me,” he says. Fueled by curiosity, Stuart enrolled in culinary arts at Red River College when he returned from his expedition. He enjoyed the hands-on learning rather than sitting in a classroom listening to a university professor’s lecture. One of the restaurants Stuart applied to out of culinary school was the now-closed Fude Inspired Cuisine and Wine Bar (named one of Ciao!’s best new restaurants in 2002.) He was told to come back when he had more experience. Six months later, the determined young cook reapplied and got the job. One year later he was head chef. “I wouldn’t recommend that path for any student fresh out of culinary school, but it was restaurant school for me,” Stuart says. Over the seven years he worked at Fude, he learned the business side of running a restaurant and essential people management skills. In his position at Thermea, Stuart is passing on what he learned, determined to provide the young cooks in his kitchen with an opportunity to continue learning after leaving culinary school. He’s combating staff turnover by creating a supportive environment. He offers after-hours master classes taught by himself and his sous chef on topics like sourdough bread baking, beer making, and pickling. He hosts staff cooking competitions. Cooks – including Red River College students on their co-op placements – have the opportunity to develop daily specials. This focus on his staff is working – there are cooks on his roster that have been there since the restaurant opened. Chef Thomas’s behind-the-scenes leadership filters its way onto every plate that leaves the kitchen. What he and his team seem to understand instinctively is the importance of each of the small details that add up to an experience – the way a perfect bite of crusty sourdough or a juicy local tomato can turn a relaxing day into something utterly luxurious.